Is Your Malarone Medication Too Expensive? Learn How People Are Paying A Set Price Of $50 A Month For Malarone Through Prescription Hope! Are you looking for a place to get your Malarone (Atovaquone / Proguanil) at an affordable price? Prescription Hope offers the top psychotic disorder medications prescribed on a national level including Zyprexa, Latuda, Aristada, Loxatine, Loxapine, Rexulti, Haldol and many more all for the set price of $50 per month for each medication! Prescription Hope is a nationally recognized prescription medication access program, headquartered in Columbus, Ohio. We access over 1,500 FDA-approved prescription medications for the set price of $50 per month for each medication. This covers 100% of the medication cost no matter the retail price. Prescription Hope is NOT a prescription discount card or an insurance plan. Prescription Hope works with over 180 U.S.-based pharmaceutical manufacturers and their pharmacy to access over 1,500 FDA-approved medications. Our medication list includes the top-100 prescribed medications in the United States offered by big-name medication companies. There are no additional costs or hidden fees associated with the medications obtained through Prescription Hope. We will never charge a fee for any medication that we cannot access for you. Create your account to fill out a free application! Contact Prescription Hope today and begin receiving your prescription medications for the set price of $50 per month for each medication. 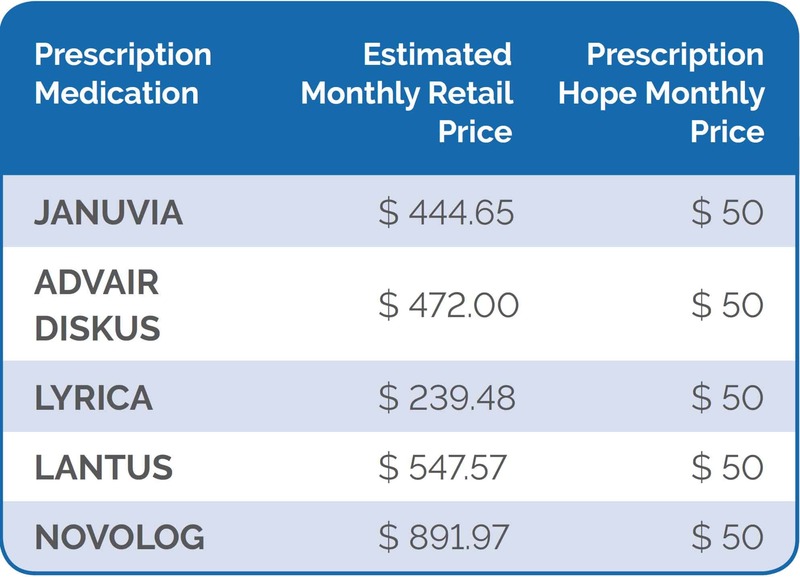 Below is a cost comparison sheet for some of our most popular medications. Do I Qualify For My Malarone Medication With Prescription Hope? Prescription Hope works with thousands of Americans every month, obtaining prescription medications on their behalf for the set price of $50.00 per month per medication. Both individuals and families earning less than $100,000 per year may qualify for Prescription Hope. If our advocates cannot obtain your Malarone medication for you, we will never charge a fee for that medication. Once you apply for Prescription Hope, our knowledgeable advocates work for you to manage, track and refill medications on time, maintain up-to-date records, and renew prescription medications every year. Once your application is approved, the first shipment of prescription medication typically arrives within four to six weeks, with refills coming on a regular schedule. Through our program, Americans save thousands every year from the retail cost of their prescription medications through Prescription Hope. Is Prescription Hope A Malarone Coupon Or Insurance Product? Prescription Hope is not a Malarone coupon card or insurance policy. As a national advocacy program that works with any coverage, you may already have, Prescription Hope is a complimentary program that works alongside any coverage you may currently have. When you obtain your medications from Prescription Hope, your total will never cost more than $50.00 per month for each medication. If we cannot help you obtain a prescription medication, we will never charge a fee for that medication. Can Prescription Hope Get My Malarone If I Have Insurance Coverage? Because Prescription Hope is not an insurance plan, our program works alongside any coverage you may currently have to obtain your Malarone medication for an affordable price. Our national advocacy program does not have medication tiers, copays, or deductibles. Every year, Prescription Hope works with some of the most prominent insurance organizations across the United States including Anthem Blue Cross Blue Shield, United Healthcare, and Humana to help individuals obtain their prescription medications at an affordable price. When adding Prescription Hope, insurance organizations can provide a better level of care for their clients. Contact us today and learn more about how Prescription Hope can help individuals obtain affordable prescription medication. Malarone is an antimalarial agent. It is used to prevent and to treat malaria infections. Prescription Hope can obtain Malarone for individuals at the set price of $50.00 per month. To obtain prescription medications, Prescription Hope works directly with over 180 pharmaceutical manufacturers and their pharmacy to obtain Malarone at a set, affordable price. Can Prescription Hope Help Me Obtain My Other Medications? According to the Centers for Disease Control, nearly one in five Americans regularly takes three prescription medications. Our advocates can work on your behalf to obtain all your medications for the set price of $50.00 per month for each medication. As a national advocacy program, Prescription Hope works directly with over 180 U.S. based pharmaceutical manufacturers and their pharmacy to obtain over 1,500 FDA-approved prescription medications, including the top-100 prescribed medications in America. Visit our website to see our full list of medications.